Ballou High School located in Southeast, Washington, D.C., has had its share of good times and bad times. During the bad times, the school experienced a mercury outbreak that closed it down for weeks, and a student was shot and killed by a fellow student on campus. Morale was low during those times. Larry Pickard, a wide receiver and defensive back for the Ballou football team, has been named the October National Student-Athlete of the Month for the Play It Smart Program, the NFL’s highly successful mentoring program targeted at student athletes in underserved communities. An honor roll student since the ninth grade and a member of the national honor society at Ballou, Pickard was selected from more than 10,000 program participants nationally. Albert Munson and Sandra Vigil, the academic coaches at Ballou Senior High School, nominated him for the award based on his performance in the classroom, on the field and in the community. "He's maintained excellent grades since his freshman year and has always been more confident about his academic ability than his athletic ability," said Academic Coach Albert Munson. This season Pickard's confidence on the field has shown dramatic improvement. The junior is currently ranked among the league leaders in Washington D.C. in both receptions and receiving yards. 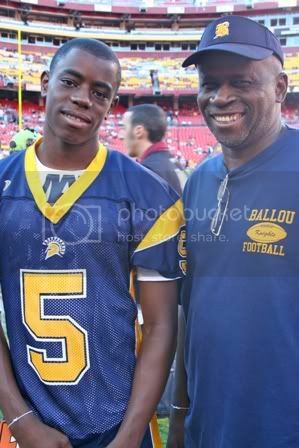 Pickard also leads the Ballou Knights in receptions and has caught touchdown passes in each of his last three games. "Larry's growth on the field, combined with his academic abilities and dedication to his community will translate into many successes for him in life," said NFF Chairman Archie Manning. "We look forward to following his career on and off the field." In addition to his accomplishments on the field, Pickard has maintained a 3.5 GPA or better for the last two years, and he has stepped forward to motivate his teammates to improve academically as well. "He's not one to look down on others because he has a better GPA, instead he leads by example and remains humble in the midst of all the recognition for his achievements," said Vigil. Pickard has been an active leader in numerous community service events, including 4th and Life, an interactive event with Washington Redskins players who address different life skills topics, the Boys and Girls Club reading program, Thanksgiving Harvest and Christmas Helping. "Play It Smart has shown me how to be a leader and that I am capable of doing much more with my life," said Pickard. "I've learned to work with others, communicate better, and feed off my teammates positive energy and they feed off mine as well." Each month the National Football Foundation & College Hall of Fame honors one student-athlete as the Play It Smart Student-Athlete of the Month. Winners are selected from nominations received by academic coaches from the more than 160 schools in 33 states. At the end of the school year the "Student- Athlete of the Year" will be selected from the monthly winners to be honored at the annual Play It Smart National Conference. Congratulations Larry! See related post on the Play It Smart Program here.